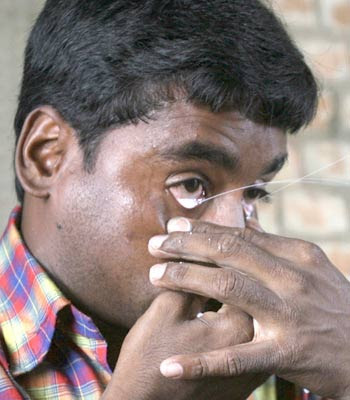 This photo shows Judhisthir Rajbansi, (30) demonstrating the skill of spraying milk from his eyelids at his house in Agarpara, some 40 kms north of Kolkata, August 2007. Rajbansi, a carpenter by profession, wishes to record his skill in the Guiness book of world records and take on other such challenges in the future. Previous post Keakraban antara monyet dan harimau . keren dan lucu !! !